Imagine all the people you meet in your life. There are so many. They come in like waves, trickling in and out with the tide. Some waves are much bigger and make more of an impact than others. Sometimes the waves bring with them things from deep in the bottom of the sea and they leave those things tossed on the shore. Imprints against grains of sand that prove the waves had once been there, long after the tide recedes. Have you ever preordered a book, without even a blurb? I mean, the story wasn’t even written yet, but you did it cuz you LOVE the author so much and know that whatever she writes you’ll buy. Well, that was me back in October. 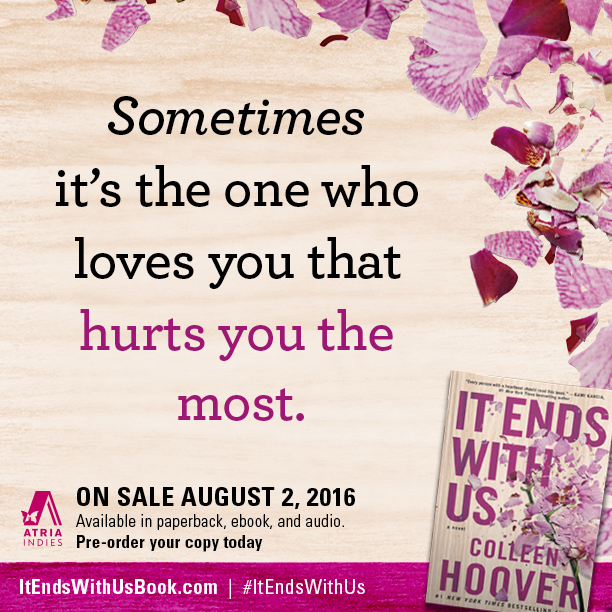 I preordered It Ends With Us, by Colleen Hoover, and then I was waiting like everyone else. Luckily I was able to read an advanced copy, so I know the impact this book is going to have and I HIGHLY recommend each of you grab a copy for yourselves. Go in blind. You MUST. Don’t read a single spoiler. Trust me. To say that I love Colleen Hoover, would be an understatement. I love and read all of her books. I know what to expect when I read them. There will be laughter and love and a nice dose of angst. But with this book… This book is so much more than that. Nothing could prepare my heart and mind for all the emotions that this book would bring out. 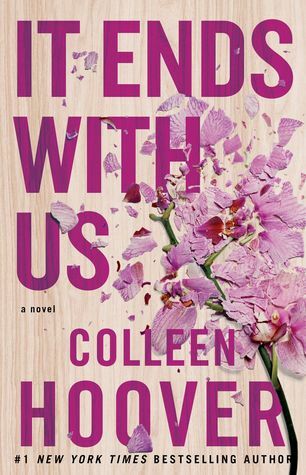 It Ends With Us is the most real book she has ever written. It’s probably the most life changing one also. It’s real. It’s raw. It’s life. This book will make you think. The world is not just black and white. There is grey everywhere you look. I can honestly say that I went in reading with one point of view and I left knowing, not that I was wrong, but, there’s just more to a story than you may know. This book will make you be a better friend. You will want to be that person for someone. The one to listen and give advice. The one who will say what needs to be said, even if they don’t want to hear it. This book will make you strong and proud. Without saying anything else, whoever reads this book will walk away with the strength to be brave and bold. I spent a good portion, of my reading, with my stomach in knots. I’ve never hated and loved characters so much before. They were perfect and imperfect. My mind was all twisted. I didn’t think I could fully comprehend this story’s impact, until hours later. Even now, I know it’ll be greater than anything I could think of. I recommend it everyone. I realize this is probably the most vague review ever, but there is no way I could say anything without saying, well, anything. Just trust me. Buy it. Read it. Let it change your life. Totally gutted over this novel. 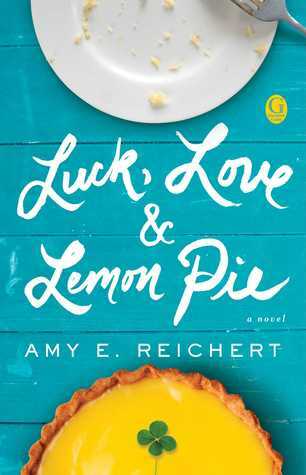 I read Reichert’s first novel in less than 24 hours and absolutely loved it! I went running to the computer to find more by her! When I was approved for this novel I think I actually did a happy dance!!! I didn’t stay dancing for long. I sometimes actually like “chick lit”…okay, so maybe this will be the only time I admit to that…. butttttttt….this novel is one of the reasons I will rarely admit it. You have a middle-aged lady who is all but ignored by her husband and children. She gets drunks, basically decides to ignore her family and seeks to “find herself” by doing exactly what has made her feel so unworthy to begin with. Not spending time with her husband, not spending time with her children and ignoring their wants and needs. No one is saying that you need to devote yourself 100% to others and ignore yourself. However, I feel no sympathy for someone who complains about how they feel unappreciated and then proceeds to go off and “unappreciate” their own loved ones and justifies it as it’s about time she did something for herself. I don’t think you need another man outside of your husband to make you feel attractive. I don’t think your husband should only find you attractive once someone else does. I think there is a happy medium and that author took the easy way out and went to the extreme. I had so many preconceived ideas about how I thought this book was going to go and I was COMPLETELY wrong. From the very first page this book had me guessing. Nan deserved a hea. Heck, everyone does!! But true to form, Nan doesn’t do things the normal way. She goes all out and makes sure it drama filled. I was never an official Nan hater, but I didn’t really like her. As we’ve seen her actions, in the past few books, we begin to realize that there’s more her than she lets on. And when this book was announced, I was so totally excited and curious as to who was going to tame this crazy girl. HA! As if she could be tamed. To say that this had twists and turn would be an understatement. So without too much, I’ll say this, Hold on tight. Nan had become a part of me even before I touched her for the first time.Watching her, I’d slowly started feeling things for the beautiful woman who was so alone yet so tough. The small things no one saw I began to cherish. I never read the synopsis until after I wrote this review. I didn’t want any influence or ideas, so I had no clue what is was about except that it was finally Nan’s turn to shine. So, to say that this shocked the crap outta me, would be an understatement. But why did I ever expect Nan to do anything the easy way. As you come to expect, the drama queen of Rosemary Beach closes out this series with a bang. 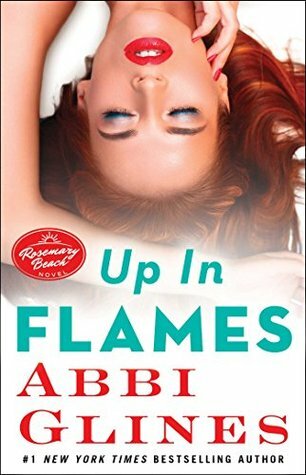 I have been a fan of Abbi’s since July of 2012, when I happened to stumble upon The Vincent Boys and then immediately into the Sea Breeze books and from then on, I was hooked. She was officially an auto buy author. I enjoy her books as they have a way of making the world calm down. While they may be emotional at times, I look forward to the break they give me, from all the angst I read. So now we say goodbye to these characters and call me crazy, but I don’t think I’m ready to let go. But I’m still crossing my fingers that she surprises us with a little something in a few years. Thank you, Abbi, for giving us such wild and crazy characters that made me laugh, cry and swoon. Get caught up with the whole gang, so you can fully enjoy the ride. You can’t capture love in a bottle. You can’t hold on to it with both hands and force it to stay with you. 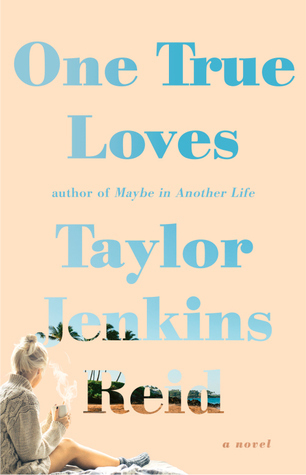 This is my first Taylor Jenkins Reid book. I’ve heard many people rave about her books, but I just never got around to trying one, since she seems more like chick lit, and that’s not my usual. But I did something out of the norm and read the blurb of this book, and I was immediately punched in the gut. I knew I had to read this. Oh my gosh!! Can you imagine this? What do you do? Here’s this poor girl faced with an impossible decision. He loves both men, but she must choose one. My nerves were all twisted up in this one. One can’t possibly just choose and be done with it. Emma has to learn who she is and what she wants before she can even think about making this choice. From the very first sentence, I was sucked into this world. I could feel what Emma felt and it broke my heart. After missing her husband for almost three years, all those past feelings come flooding back into her. She must face her past and decide who she wants to spend her future with. While this isn’t your traditional happily ever after, but rather a bittersweet ending, I am glad to have gone this journey of reflection and growth. I am happy to see Emma face this decision head on. While the journey did make me wince a few times, since I made my own choice, I can see that Emma did what needed to be done in order to make her choice. There is nothing more romantic than this. Holding the very person that you thought you’d lost, and knowing you’ll never lose them again. I stayed up until half past one in thee morning to finish this one. I read over 60% of it in one sitting. That never happens anymore. I can’t remember that happening in years. What an amazing read. I loved every word!!!!!! This is a story that grabs you from the first page and just tightens its hold on you as every single page speeds by. The ending doesn’t disappoint either. The main character is a woman who goes on the run after she finds her husband dead. We soon figure out that this isn’t the first time she’s ran. As the story continues we start to see correspondence (emails) between her and a mysterious man from her past. It’s obvious that they love(ed) one another. It’s also obvious that they both have secrets. The emails they send back and forth made this a 5 star read for me. They were always short. They never gave much away. But man oh man, did they have your imagination racing out of control. We might not know if the main character is innocent or not from the start of the tale, however, she soon finds herself in countless situations where she is far from innocent. I realise that these situations will put many off this book. I also sense that this is a love it or hate it book. If you live in a black and white world I don’t think you’ll enjoy this as much as I did. However, my moral compass has never been so clear. I don’t use the end result of a situation to determine the right or the wrong. Would this main character have resorted to some of the things she did if the circumstances were different? If she hadn’t resorted to them would she still be alive? Would others still be alive? 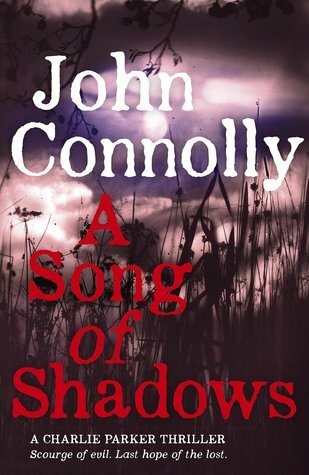 Reading this novel 20 years after reading it the first time was a bit of a shocker. I won’t lie. Reading it as an adult…well, again, I was shocked in places. I sometimes feel it’s pointless to review a book that has millions of reviews already….however, I would be remiss if I just skipped over this novel and acted like there was no inspiration drawn from it. Even though there is no possible way for me give a review worthy of the book. Parts of this book made me uncomfortable in my own skin. It’s hard to put into words the hypocrisy and the love that members of the South had for their slaves. Or even the same that the slaves had for the South. Harder still to see so many fight for a way of life that was in many ways just a matter of pride. I think Scarlett was a horrible person in many ways. She lacked intelligence when it came to understanding people and any type of “book sense”, but I think her feelings about the war and the South were often spot on, no matter how many would disagree. There are just so many things in this novel that one could review about…so I give up…a million thoughts are running rampant through my mind right now…it’s impossible to pin one down before another one goes running off in another direction…so I shall stop and leave you with an unfinished review…go read this book. It’s worth the weight of the book in your hands to read. One almost needs to feel the weight to appreciate the weight inside the pages as well…. I only wish to say that when I read this book as a teenager, I wasn’t so completely in love with Melanie as others were, in fact I had little to no patience for her. I had no time for Ashley from the very start, I wasn’t drawn to him in any way, shape of form. 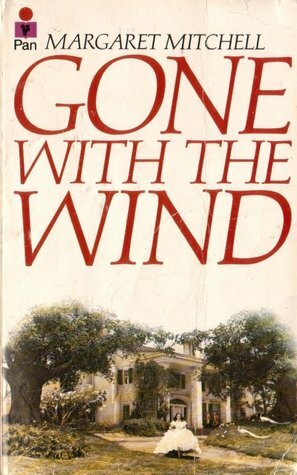 I thought Rhett Butler was one of the most honest, handsome, and daring men every. I didn’t know if I loved or hated Scarlett. And finally, I think the ending was one of the most brilliant endings of all time. I *really* like this Charlie Parker guy! Besides Parker, I also really enjoy the other characters in this series as well. In many ways, we get to know and love Charlie simply by watching how others act and respond around him. It’s not something I’ve thought about much before. Usually a character is revealed simply by how they act and respond to situations. By what they say and do. Here, Connolly does a superb job of showing Parker’s character by those that go out of his way to help him. To watch over him. We learn to love Parker by the love they show him. 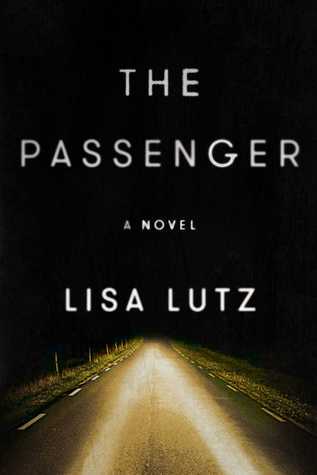 The father/daughter relationships in this novel….just wow….I can’t give much away, but I will say —- the last line gave me chills and I almost cried aloud that it ended! I’ll be counting the days until I start the next in the series! This novel starts with Charlie recuperating from an injure he obtained in the last novel. It also has him in the midst of a few murders….and nazis. We revisit some of the crimes from the Holocaust. I have to admit, I have not really gave much thought to those war criminals after the fact. It brings up some important moral issues as well. Can one ever commit a horrendous crime simply because of the circumstances they found themselves in? Furthermore, can you be removed from those circumstances and form that day forth do wonderful things and to help the human race? Should any of that good change how you should be dealt with in regards to the original crimes? How often are criminals sought after only because of political pressure? Where does moral obligation come into play? Finally, I encourage you to read this novel. Not just because Charlie Parker is so great. Not because of how much you love his friends. Not because of all of the inter-workings of some really complex and interesting relationships…. But because this book left me with a yearning to learn more about history. I found myself putting down this novel…not because I was bored. But because I wanted to run to the internet and look up more about war criminals and history. Because I wanted to better understand how some of the things discussed in this novel could have happened. I don’t think I found many clear answers. However, I did have discussions about it. And so very many questions! Sometimes in life, it’s really good to just ask the questions….even if you don’t get all the answers you seek….at least you’ve thought enough to ask them…. Confused? Read the book….you’ll understand then….